This is a 60mm, Connoisseur model of Napoleons brother-in-law, Joachim Murat. Murat was a Marshal of France, Grand Duke of Berg, King of Naples and Grand Admiral of the Fleet. He had a collection of three hundred and sixty five different uniforms, a stable, at its most, of fifty two horses, (one for every week of the year if he so wished), and preferred to carry a riding crop when charging into battle rather than a sabre. When asked by the French General Kellerman, why he did this, Murat looked quite amazed and replied, “My dear Kellerman, if I withdraw my sword it will merely upset the balance of my uniform”! 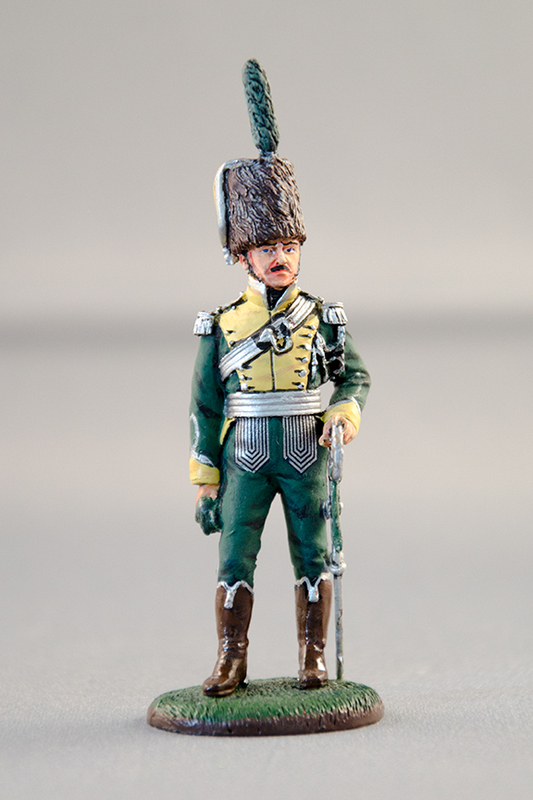 Murat can also be portrayed in 90mm scale. The model illustrated is a collectors matt piece which is also available in traditional high gloss.